Integrated E-commerce software solution delivers significant value to Unleashed Technologies and their retail clients. Successful retailers have to do more than just set up an online store. 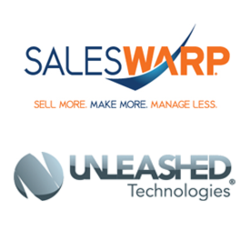 SALESWARP, a Storefront Management System that helps retailers increase sales while reducing E-commerce operating costs, announced they have formed a Gold-Level Partnership with Unleashed Technologies, a single source provider of enterprise technology, website design and hosting solutions. This partnership enables Unleashed Technologies’ clients to streamline all of their E-commerce operations and manage all customer, product and order data from a single platform. SalesWarp, a commercial open source solution, helps retailers maximize resources and deliver ROI by providing a scalable E-commerce platform for improving time-to-market, streamlining operations and expanding market reach. Operationally, SalesWarp empowers retailers to connect all of their E-commerce systems and processes from one platform through advanced automation. SalesWarp then provides tools to manage product, customer and order data, pricing strategies, order management and fulfillment, data feeds, marketing campaigns and analytics to help retailers increase sales by delivering more products to more markets with more intelligence. Unleashed Technologies solves difficult web technology problems through building, planning, and providing on-going support for websites and applications. By combining web design and development solutions with core IT support, Unleashed Technologies' innovative solutions exceed at helping organizations reach their goals. Unleashed Technologies has been awarded with three Blue Drop Awards for excellence in Drupal development, including Website of the Year. “This partnership will deliver tremendous value to our current and future clients. Unleashed Technologies web design and development expertise combined with SalesWarp's unique technology will allow online retailers to handle any level of complexity or growth while further enhancing the online storefront user experience”, states Michael Spinosa, CEO of Unleashed Technologies. SALESWARP, developed by 6th Street Commerce, is a web-based Storefront Management System specifically designed to help retailers build and manage their online stores more efficiently while increasing sales and reducing operating costs. Built on an open-source framework, SalesWarp gives retailers the power to manage inventory, orders, fulfillment, shipping and customers in real-time; reach more customers in more markets; and intelligently price and promote products across multiple channels, including point-of-sale systems. SalesWarp was originally developed in 2008 to provide a better way to manage high order volumes and inventory from multiple warehouses. Today, SalesWarp provides retailers with a complete E-commerce platform with all the tools and technologies needed to manage a successful E-commerce business. Unleashed Technologies, Maryland’s leader in web and hosting solutions, offers what no one else can: unparalleled web design, development and integration capabilities backed by a proprietary enterprise hosting environment. Unleashed Technologies solves difficult web technology problems through building, planning and providing continuing support for websites and web applications. With Unleashed Technologies web solutions, our clients unleash their web potential through a state-of-the-art web experience that is simple to maintain and manage, increasing engagement for visitors and drastically reducing resources needed to reach their goals.